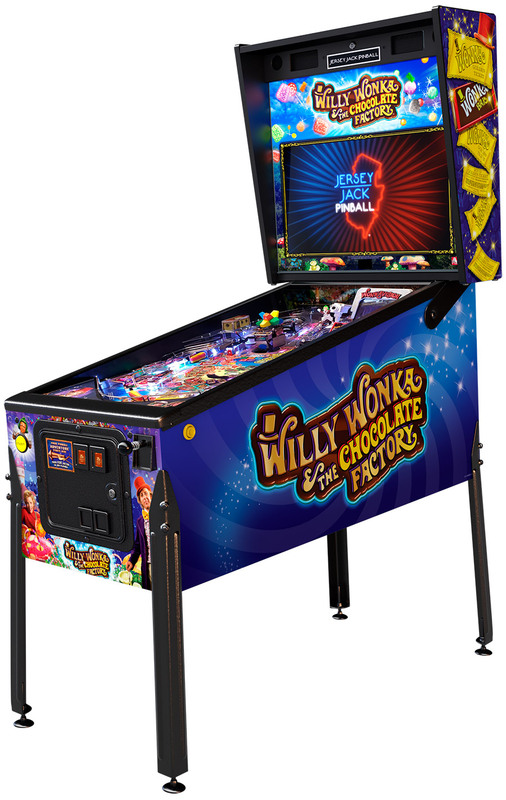 Jersey Jack Pinball today revealed their fifth and latest title, the Pat Lawlor-designed Willy Wonka & The Chocolate Factory. The game was premiered during the JJP seminar at the Midwest Gaming Classic in Milwaukee on Friday 12th April, but it will also receive a European unveiling at the Flip Expo show in Le Treport, France the following day. 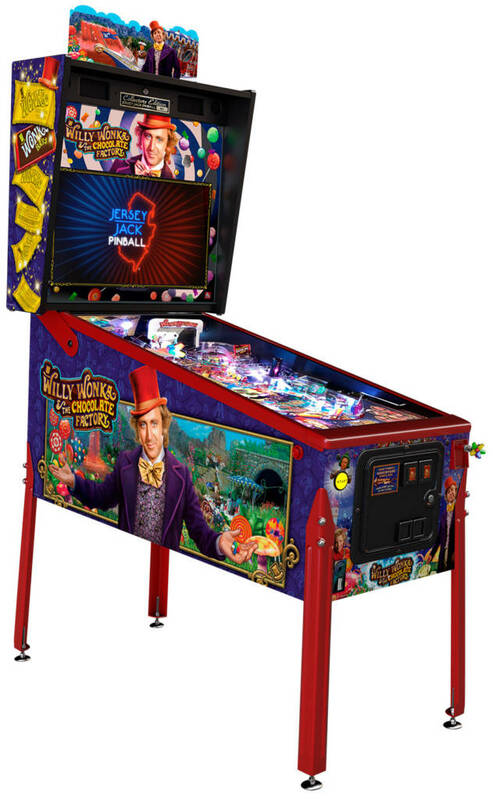 Pinball News was provided with pre-reveal pictures and information about the game so we could bring you all the details as early as possible, but we are also in Le Treport for the official unveiling there. Jersey Jack Pinball’s latest title is Willy Wonka and the Chocolate FactoryWilly Wonka & The Chocolate Factory comes in three models. The base model is the Standard Edition which can be produced in unlimited quantity. The Limited Edition is also virtually unlimited with a high restriction of 5,000 machines maximum, while the top-end Collector’s Edition is truly limited to just 500 machines. 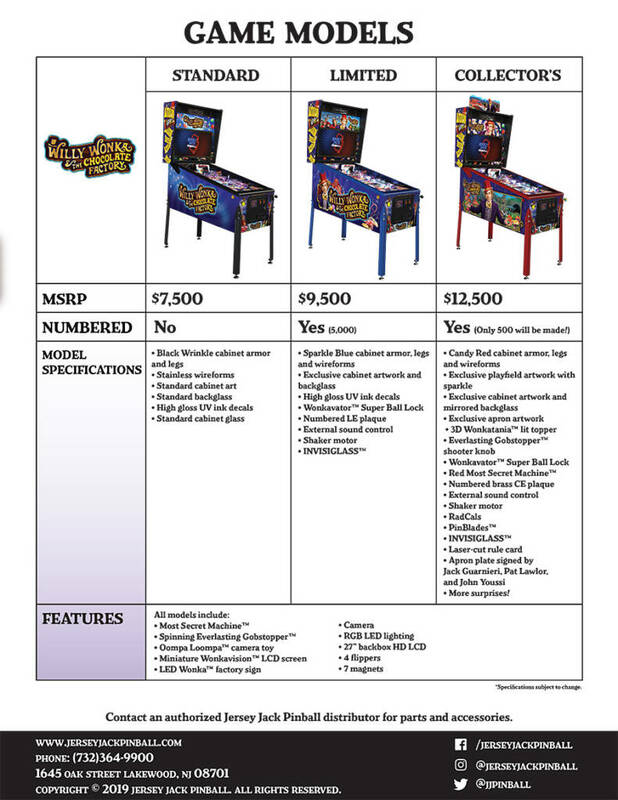 Let’s take a look at the cabinets and backboxes of the three variants. The left side of the Standard Edition The right side of the Standard EditionThe Standard Edition features wrinkle black metalwork all round, has a regular shooter rod and has the plainest of the three cabinet artwork designs. Now, on to the Limited Edition. The left side of the Limited Edition The right side of the Limited EditionThe Limited Edition adds blue powder-coat to the metal parts. The cabinet front and backbox sides look the same as the Standard, but the cabinet side artwork adds some extra elements to the composition. Finally, we have the Collector’s Edition. The left side of the Collector’s Edition The right side of the Collector’s EditionThe Collector’s Edition is the full package, with sparkle red armour, a custom shooter rod and an illuminated 3D topper included. There are many other differences between the three models as shown in the feature matrix below. So the price ranges from $7,500 for the Standard to $12,500 for the Collector’s Edition, but that premium price adds a bunch of cosmetic enhancements and gets you that exclusivity of owning the top-of-the-range model. 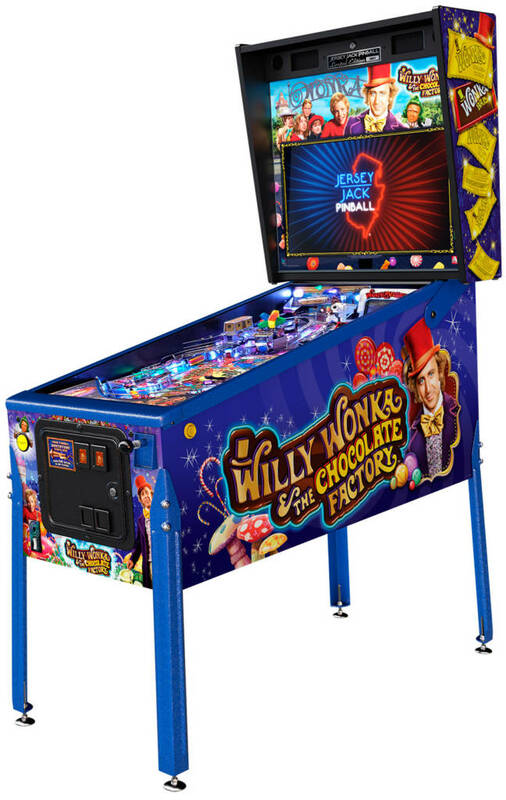 The Limited Edition and Collector’s Edition both have the added playfield feature of the Wonkavator Super Ball Lock, together with a shaker motor and anti-reflective Invisiglass fitted. On paper, the Limited Edition looks the best model for the money, but time will tell. So, what’s on the all-important playfield? Here’s a look at the Limited Edition. As you can see, there’s a lot packed into this regular-size playfield. 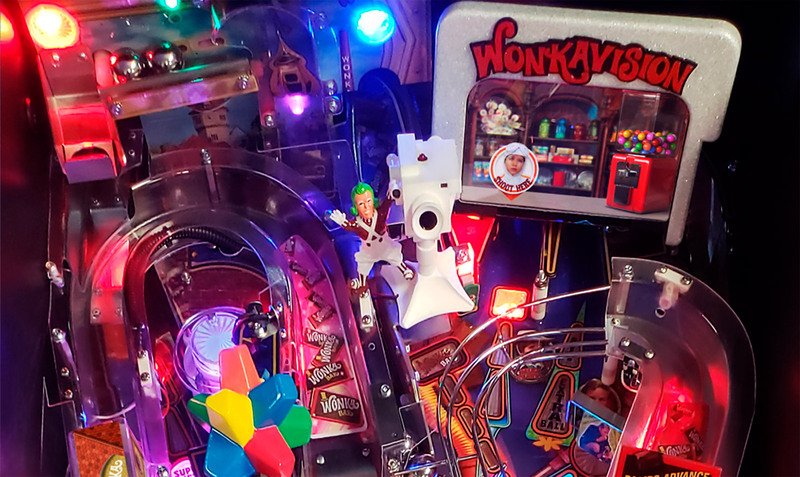 Four flippers, a bash toy, a Wonkavision second screen, an Oompa Loompa playfield camera toy, a captive ball, two ramps, a back panel ball lock and, amazingly, a total of seven magnets. The top part of the playfieldAt the top of the playfield you have most of the fun features, and if you thought Dialed-In! 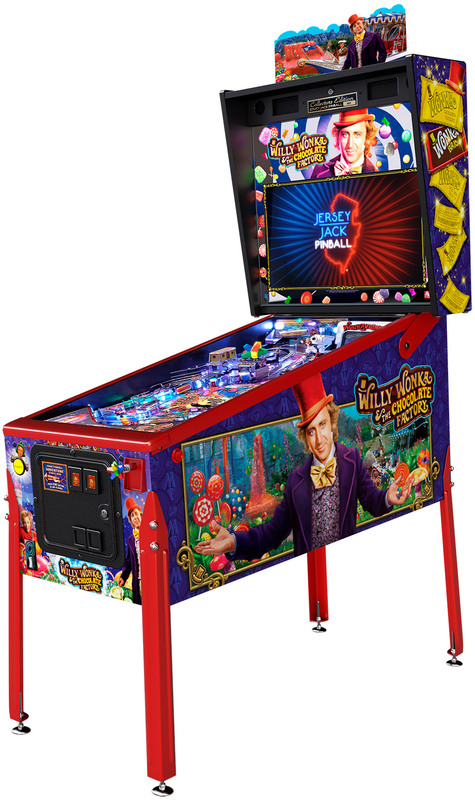 was busy, Willy Wonka packs in even more. The Wonkavision screen is paired-up with the camera toy, while a total of four shots go under and around the display. Things don’t get much more spread out as we move down the playfield. The upper-middle of the playfieldThe hidden fourth flipper is under the right ramp, giving shots at the upper lanes and the captive ball. In fact, all four flippers should be able to hit the captive ball, the value of which is increased by shooting the ramps. The left ramp looks as though it contains a ball lock and kickout, which would make sense if the back panel secret ball lock is only available on the upper two models. The everlasting gobstopper toy spins, while there is a bash target to give a range of awards. One big differentiator in this game is the way many of the inserts have a dedicated use and descriptive text on them, rather than being plain inserts and relying on the screen to convey their purpose. That should make it easier to understand the rules and the likely awards available. It appears there is only one pop bumper, although it could be augmented by the use of adjacent slingshot kickers. 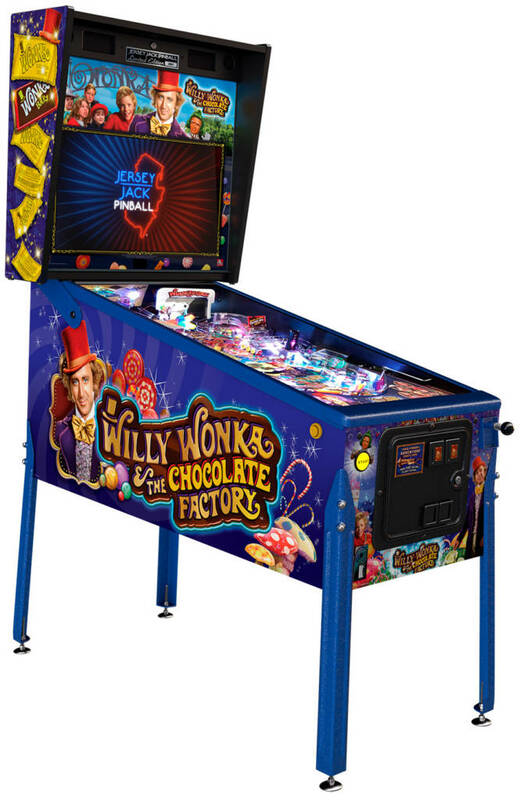 The lower-middle playfield areaThe descriptive insert labels continue as we move down the playfield, with a Wonka Bar counter, a number of scoring awards and the factory entrance scoop which appears to kick out into the shooter lane. 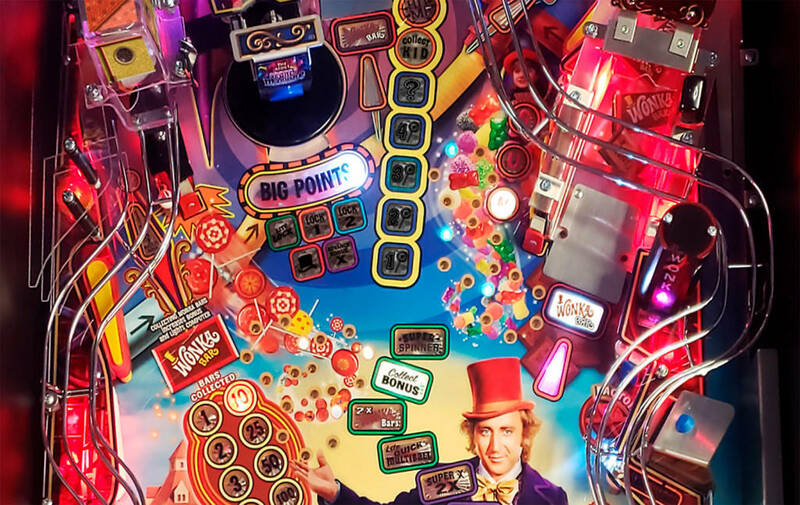 The bottom of the playfieldThe five golden tickets are shown above the main flippers, as well as the Welcome to the Factory wizard mode. Specials can be awarded in either outlane, and there is a physical kickback in the left outlane. 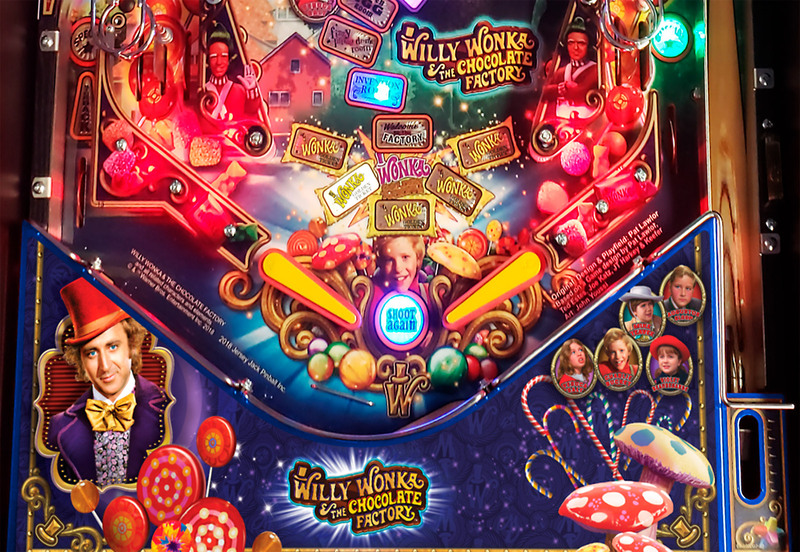 On the bottom apron, the five children who found the golden tickets are depicted. They are: Veruca Salt, Charlie Bucket, Mike Teavee, Augustus Gloop and Violet Beauregarde. Charlie also appears just above the Shoot Again light between the lower flippers. The game credits in the right outlane list Pat Lawlor as providing the original design and playfield, saying it based on a game design by the JJP crew of Pat, Ted Estes, Joe Katz, JT Harkey and Keefer (Keith Johnson). Long-time Lawlor collaborator, John Youssi, provided the game art. 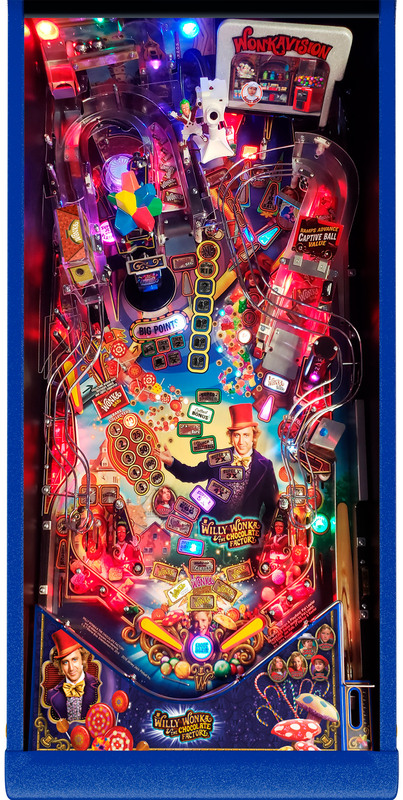 If it were any other designer we might almost think there are too many shots packed into the playfield, but Pat Lawlor did a great job making so many smooth shots in Dialed In!, so we look forward to playing Willy Wonka to see if he has performed the same magic again. 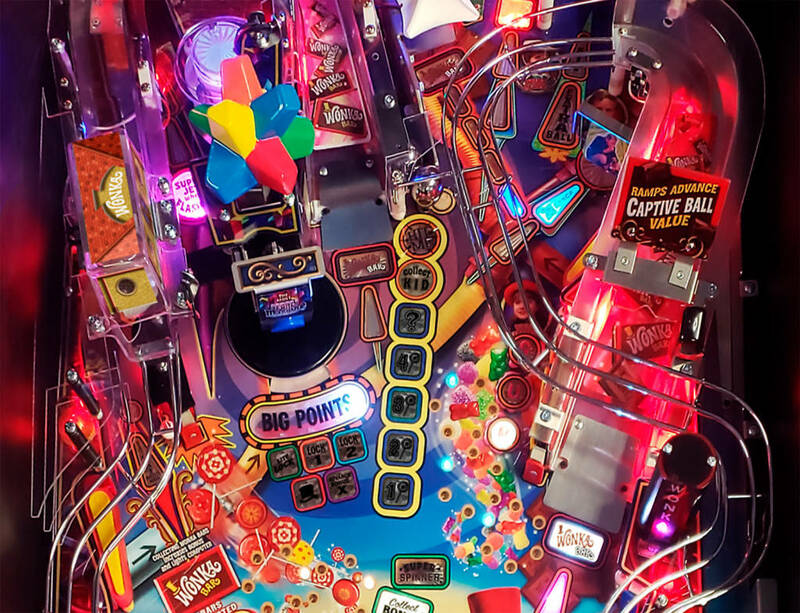 Watch out for our report on the European launch in our Flip Expo 2019 coverage which will be coming up shortly, while the US launch will be included in our Midwest Gaming Classic report also coming up on Pinball News shortly.